It’s been a while since I’ve talked about it, so today’s mid-week article is going to be about Heroes of the Storm! While it isn’t a new hero every week like I originally predicted (waiting on PAX East for new heroes to be announced it seems! ), Blizz are spotlighting heroes, and even going as far as to make short cinematics for each of them, such as the one above. This week, as you may have guessed from the title and clip above, we’re moving from the Koprulu sector in the Starcraft universe to the High Heavens and Sanctuary of the Diablo franchise. He is the stalwart defender of humankind and Sanctuary. With his mighty sword El’druin, he intevened and defeated the Prime Evils before they could enslave all of humanity. Although his story continues on in Diablo III, it is the Archangel of Justice we fight as in Heroes of the Storm. Blizzard classes him in the Warrior role where he has high sustainability but low damage, but from what I’ve seen him played as so far, he seems to do well in both Warrior as well as Support roles. He excels in poking at the enemy and generally annoying them, and his trait makes him effective even from the grave. Please note that at the time of writing this article, Heroes of the Storm is in technical alpha, and I’m not in the alpha to be able to check live updates, so chances are that some of the numbers may have been tweaked and are yet to be updated on online sources. [Trait] Might of El’druin: When Tyrael is about to due he becomes invulnerable and explodes after 3.5 seconds. Deals 200 damage to nearby enemies. [Level 1 Upgrade] Protection in Death: When Might of El’Druin explodes, Tyrael also grants nearby allies a shield that absorbs up to 50% of their max health in damage. This shield lasts for 5 seconds. [Level 16 Upgrade] Atonement: On dying, move speed is increased by 50% and Tyrael resurrects 10 seconds faster for every Hero hit with Might of El’druin. This trait is pretty badass (when you remember that you’re still active for a few seconds after you die). I believe the damage does scale for later levels, so it makes enemies think twice about killing you first in fights. Killing you early means that everyone gets a chunk of their health taken away, or your team spreads to avoid it, and if he has taken the talent then you’re faced with enemies with a sudden increase in health too. This allows Tyrael to continue poking away at enemies and being a general nuisance with his other abilities that can really make an impact on teamfights. And that level 16 upgrade will be pretty annoying, knowing that if you kill him he’ll just be back up to 50 seconds faster. [Q] Punishing Blade: Deals 350 (84 + 14 per level) damage to enemies within target area, slowing them by 25%.Reactivating while the blade is present will teleport Tyrael to his blade, dealing 350 (84 + 14 per level) damage and slowing enemies by 25% in an area around it..
[Level 1 Upgrade] Horadric Reforging: Increases the damage dealt by Punishing Blade by 20%. [Level 7 Upgrade] Angel’s Grace: After teleporting to his sword, Tyrael’s move speed is increased by 25% for 3 seconds. [Level 16 Upgrade] Holy Might: Tyrael’s next 3 auto-attacks after teleporting to his sword deal 100% more damage. [Level 16 Upgrade] Angelic Barricade: A 3 radius pathing blocker is created after Tyrael teleports to his blade. [W] Righteousness: Shields Tyrael, absorbing 250 damage for 4 seconds. When the shield expires it explodes, dealing 510 (168 + 18 per level) damage to nearby enemies. [Level 4 Upgrade] Regeneration: Enemies that attack Tyrael while shielded grant him regeneration, gaining 30 health over 3 seconds. [Level 13 Upgrade] Zealotry: Increases duration by 100% and the explosion damage by 25%. [Level 13 Upgrade] Imposing Will: Enemies that attack Tyrael while shielded have their Attack Speed slowed by 50% and Move Speed slowed by 50% for 2seconds. This ability heavily reminds me of Abaddon’s Aphotic Shield (minus the purge ability, and it’s only usable on Tyrael himself). It allows him to be a little more tanky, as well as continuing his nuisance in the middle of team fights. Again, the talents aren’t game changers, but they still have their place, and allow Tyrael to become even more tanky, and then deals just over 600 more damage when it expires – or you can deal 125 less damage and sacrifice some ramp-up time to go for some CC, though the second level 13 option does require enemies to attack Tyrael. Even with these two abilities so far, he can dish out ~1500 damage each if he dives into a group of 5 enemies. It’s not going to kill anyone, but if you have 4 buddies at your back, it can definitely force the lane forward. [E] Hand of Sacrifice: Redirects the next 1000 (240 + 40 per level) damage dealt to target ally to Tyrael instead. This damage is reduced by 25%. Lasts 10 seconds or until Tyrael and his ally are too far from each other. Cannot be used on self. [Level 4 Upgrade] Cleansing Sacrifice: Hand of Sacrifice now removes all stuns, roots, silences, and slows from the target. [Level 7 Upgrade] Hand of Providence: Enemies in the beam take 20 damage every half second, deals double damage to minions. [Level 13 Upgrade] United Purpose: While linked, Tyrael and his target’s move speed is increased by 15%. This is where Tyrael stands more in the support role than other warriors, and gives enemies another reason to try to disable or take him out of team fights. Turning 1000 damage on an assassin or a specialist into 750 damage to Tyrael is pretty insane at a 13sec cooldown, and even if Tyrael dies he has his trait to back him up. For support players using Tyrael, this becomes the defining ability that makes him who he is. The talents themselves can also become game changers, linking up with someone like Valla or Zeratul (though be careful linking with invis heroes as enemies will be able to see them better) will certainly help them not only with lane sustainability, but as a means of getting out if things do turn sour. [R] Judgment: Charges the target, dealing 325 (135 + 10 per level) damage and stunning them for 2 seconds. While charging, nearby enemies are knocked back and take 150 (55 + 5 per level) damage. [Level 20 Upgrade] Angel of Justice: Increases the cast range of Judgment by 50%, and reduces the cooldown by 30seconds. The first of his ultimates grants him another way to initiate into combat, and is likely going to be the main way he does, being able to use his Q attacks while already in the fray (or to escape). The cooldown is long at 100 seconds, so the level 20 upgrade is almost required so that it’s up for every team fight – you don’t want to be waiting around to use it so that your enemies can push against your lane, plus the pushback is fairly sizable when the rest of your attacks favour enemies that are stacked up. You could admittedly use it defensively to take melee heroes away from your squishy supports and assassins, so there is two sides to every coin. [R] Sanctification: While channeling, Tyrael makes all nearby allied Heroes invulnerable and unstoppable. Lasts 3 seconds. Does not affect Tyrael. [Level 20 Upgrade] Holy Arena: Increases duration of Sanctification by 1 second, also increases attack and ability damage by protected allies by 25%. His second ultimate certainly lends to his support role much better than Judgment does, and with the level 20 upgrade it’s certainly going to make your enemies flee behind the defense of towers and gates. The only problem with this ability of course is that Tyrael has to channel it, and because he’s not invulnerable or non-CCable, as soon as that bubble goes out, you’re likely going to be focused very shortly afterwards – though it would certainly be OP if he was immune or could move around with the bubble. With the ultimate’s short duration, you need to communicate with your team mates when you’re going to use it, especially if you take the upgrade at level 20 when they’ll start hitting harder. As for skins, he currently has two available to him in the alpha: Demonic and Seraphim, both looking pretty awesome as shown in the images below. 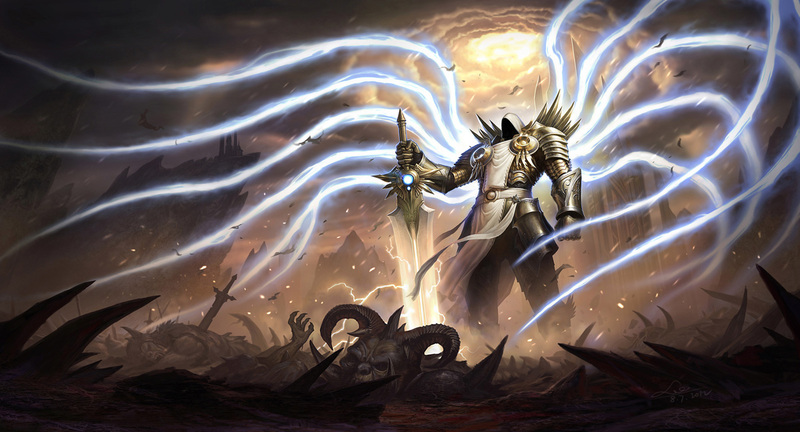 It’s certainly interesting to see Blizz go for skins of what could have happened to Tyrael had he either succumbed to corruption or became more warlike and stuck around in the High Heavens. I personally won’t be spending money on either of these skins, though if it turns out that I enjoy the playstyle of Tyrael, that demonic one certainly does seem pretty enticing… would love to see what Blizz could do with a mortal form Tyrael as a skin though, where he’s unhooded and in plain robes.